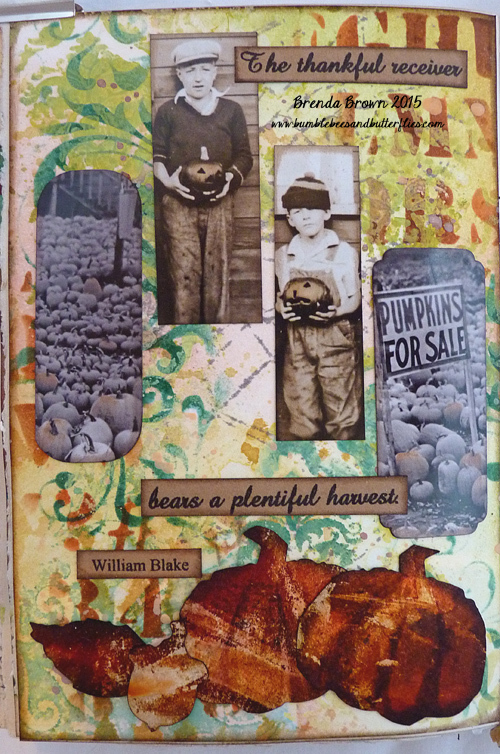 Alison has set a new challenge at A Vintage Journey which incorporates art journalling with Tim Holtz, so that set me thinking. Wanting to use the found relatives photos and some dies I first set about making the background. 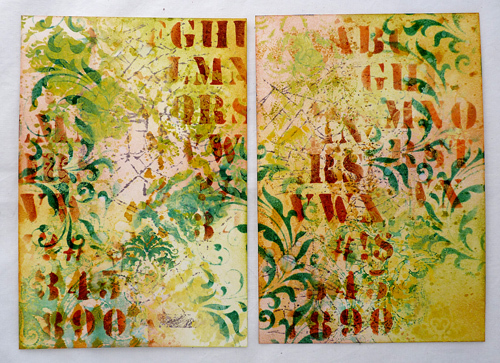 - distress paint resist using picket fence, mustard seed, pine needles and shabby shutters distress paints with the gothic stencil. 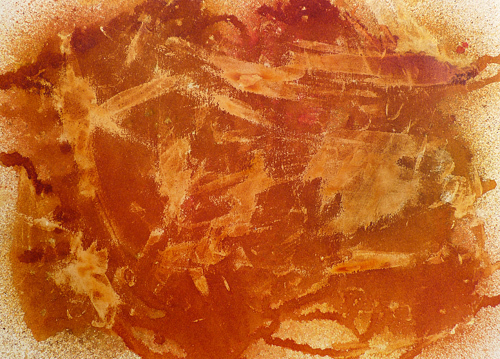 For the die-cuts I took an A4 piece of card, rubbed on some matte medium randomly, dried it then sprayed with six orange, red and brown distress stains. 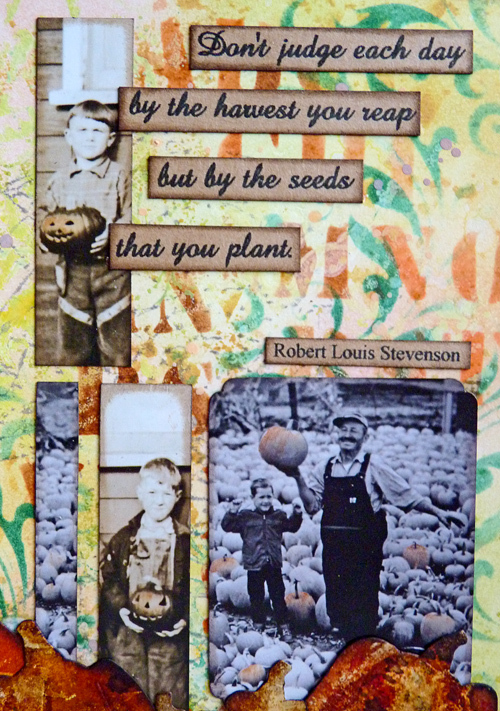 Once I had die cut the pumpkins, acorns and leaves I blended and dipped them in more distress inks to create the added texture. - now we're ready to assemble everything together. ... and the pages came together. 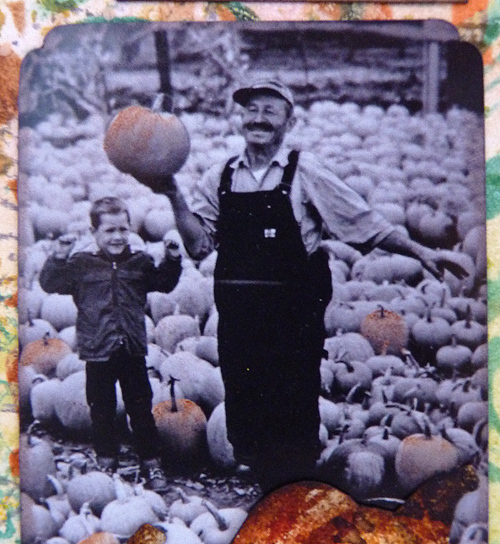 I finished off with some photo tinting just a bit of rusty hinge on a few of the pumpkins. This is my altered journal. In January I challenged myself to do a journal page a week. I haven't quite manged every single week, but I now have 35 double page spreads and the book is fat and almost full. Art journalling with Tim? Yes I think so. Thanks Alison for a great AVJ challenge, it made me think about what are Tim's influences in the journalling world and there are quite a few. Do pop over to see the amazing collection of journal pages from the Creative Guides. Have a great weekend, I am off to the Swanage Blues Festival for the weekend and hopefully it will be good weather so we can have some walks along the beach. 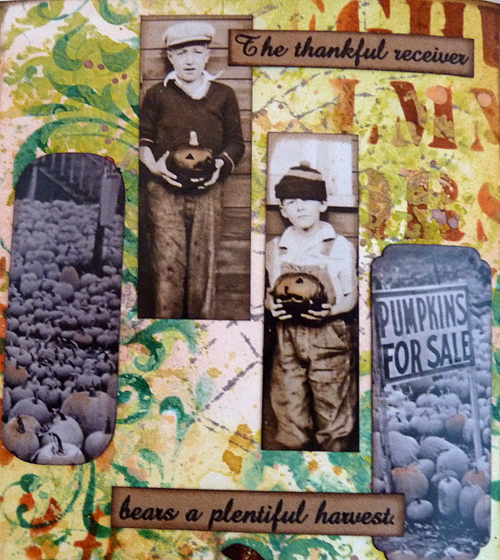 I just love this heart-warming harvest themed page spread... from the gorgeous colours of the layered background to all those fantastic vintage images full of pumpkins - a real delight! Such great subject matter and color. Beautiful pages!! was für eine detaillierte schöne Arbeit. Brenda, as always, beautiful work! I love how you have brought an on-time no theme to your pages. Love the. I love photos and and sentiments you've added to your lovely "artsy" backgrounds. 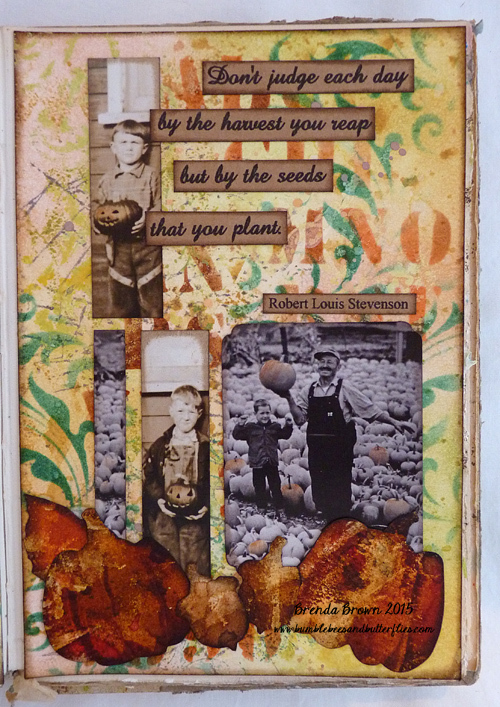 I absolutely adore the background to this spread Brenda, super stencil work and the additional collage elements have given it such a wonderful autumnal feel! Wonderful journalling pages! Wow ..wonderful pages Brenda! Gorgeous ! 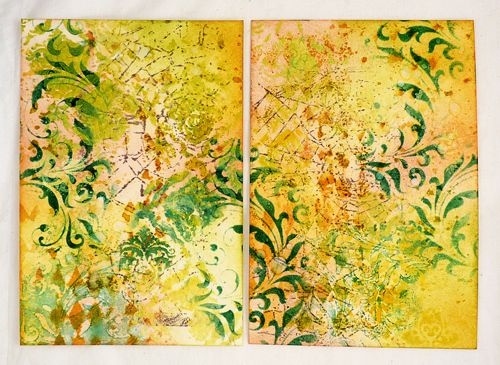 I come really in autumn - weather - mood when I see your journal page, beautiful colors, good background. What a wonderful autumn feeling, fabulous!!! Brenda, you had me at your colorful background, but your embellishments and those quotes are a perfect compliment! 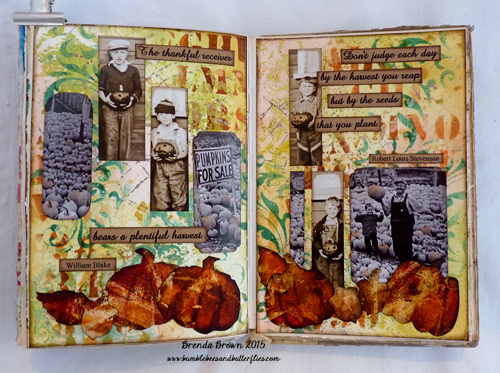 What a fun journal spread, Brenda! I love the pumpkins galore theme and so appropriate for this time of year! The background is fabulous and love the images! Enjoy the weekend! Hugs! 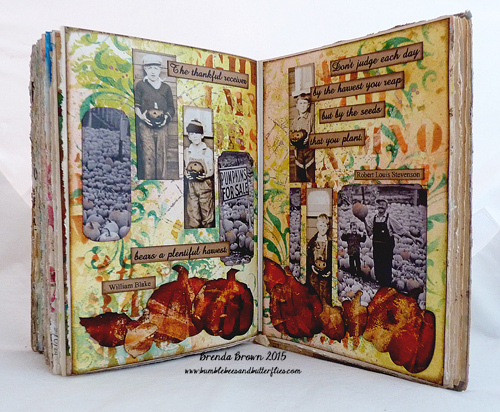 Super autumnal pages and a lovely journal spread. The pumpkins are the perfect embellishment. Two of my favorite images!!! LOVE the background...so gorgeous! I want to see some colorful leaves!!! A real harvest festival of autumnal colours ! Brenda . Love all the stenciling and how you crreated the colour on our die cuts . They look really fab on your background pages and really draw the eye to the wonderful images .